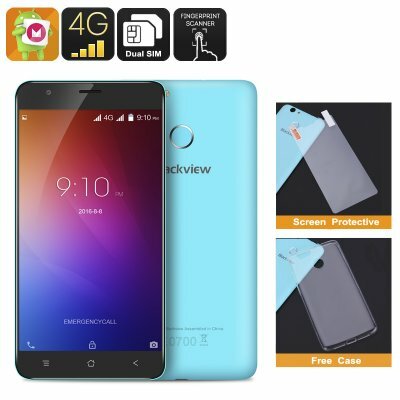 Successfully Added HK Warehouse Blackview E7 Smartphone - Dual-SIM, Android 6.0, 5.5 Inch Display, Dual-IMEI, 4G, Quad-Core CPU (Blue) to your Shopping Cart. The Blackview E7 is a beautiful Android phone that comes with all the features needed to get through a day filled with mobile entertainment and connectivity. Along with its sleek design comes a stunning 5.5 Inch display that portraits great visuals and vivid colors. By delivering stunning detail, watching a movie or playing a game on this Chinese smartphone truly is a media experience like no other. Coming with 16GB of memory and the possibility to insert a 64GB Micro SD card, this Blackview smartphone offers oceans of space for you to store all your favorite media. Running on an Android 6.0 operating system the Blackview E7 comes with all the features that Android users are familiar with. Delivering a smooth and ultra-fast user experience you can be assured that all your media, games, and applications will be launched in a split second – allowing you to enjoy your mobile entertainment experience to the absolute most. Its Quad-Core CPU that has been clocked at 1.3GHz further enhances your user experience by providing you with all the power needed to run the latest and most demanding games and media without dropping a frame. At the back of this affordable smartphone you can find a lightning fast fingerprint scanner that allows you to unlock your phone and enter your personal files in a split second. From now on there won’t be the need to remember long passwords or difficult unlocking combinations to open your phone as with this fingerprint scanner you’ll be able to access all your files with the touch of a finger. Located above its fingerprint scanner is a sophisticated 8MP camera that lets you snap beautiful images at any time of the day. Additionally, the 2MP front camera is the perfect snapper for all selfie lovers out there – allowing you to snap pictures of all those special moments in life. Featuring Dual-SIM and IMEI numbers the Blackview E7 takes connectivity to the next level as it allows you to be connected to two 4G network providers simultaneously. Enjoy the fastest data speeds out there and be reachable on two different phone numbers at the same time, with this Chinese smartphone you’ll always be within reach to your friends and loved ones. A massive 2700mAh battery additionally allows you to browse the web, engage in phone calls, and enjoy all your favorite media for up to 10 hours in a row – truly letting you take the most out of this beautiful Android phone.